This year I have read many great reviews and mentions of facialist Su-Man Hsu in the British press, as this wonderful woman with a tiny dancer’s body has one of the most nimble fingers and gives the most amazing facials. What makes me smile is how many journalists call her ‘strict’ or ‘reserved’ when it actual fact she is a hard-working & focussed professional, who cares deeply about her clients and making sure her facials and skincare products deliver lasting results. 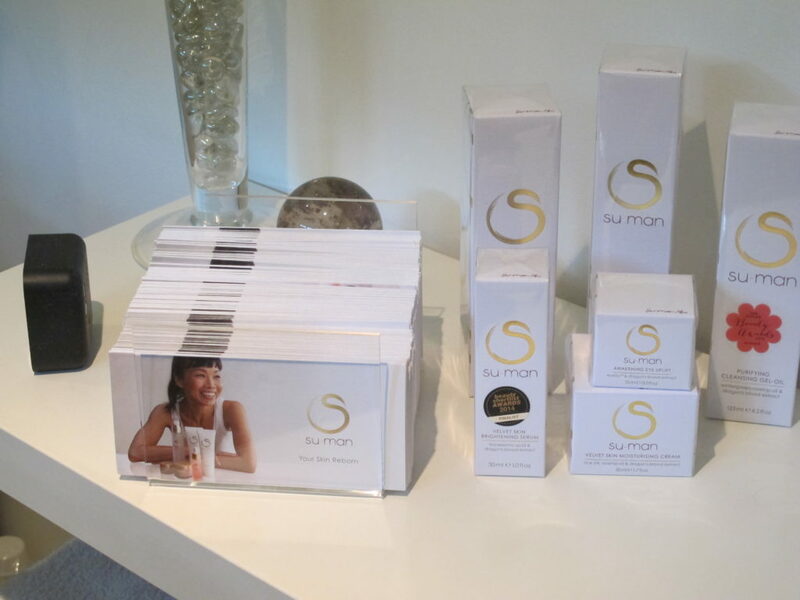 I have been already using Su-Man’s skincare and have seen her work at the Anti-Ageing Show in Olympia earlier this year, so when I drove to Su-Man’s home to have a facial with her I had a vague notion what to expect. When Su-Man opened the door & let me in my first thought was ‘my goodness, I want to have a lithe body like hers and such a perfect face as well’. She truly looked like a young girl that day, her long hair in high pigtails, the way the mischievous Pippy Longstocking would wear them and yet she has tremendous wisdom, seriousness and experience radiating from her eyes. Su-Man led me into the tranquil garden, at the back of her house, where her treatment room is located, in a glamorous shed like cabin. Inside you are greeted by a light, airy space that is modern yet old-fashioned, in a comforting way. We talked about my skin or possible concerns that I had and Su-Man did a computer analysis of my skin with a device attached to it, which transmitted reading straight to the screen. I was told that my skin was normal but had inflammation underneath and with that I was told to get undressed and zoom under the warm blanket on the treatment table – no time lost here! Su-Man is curt and to the point but is in no way aloof as some reviews would suggest. There is a military precision to her but it is more to do with her dancer training and discipline. She put a rolled up blanket under my knees, to make sure I was aligned ( my spine was very grateful ) and comfortable and started her work. The rest of the facial is a bit of a blur of the most wonderful kind. I had a firm neck and shoulder massage, while my face was steamed and then cleansed and extractions done. Su-Man’s massage technique is hard to describe, her fingers move all over the face, zig zagging, rolling, circling, digging deep deep into your muscle tissues. She massaged my ears and rolled them like a cigarillo – it is heavenly albeit unusual. Within seconds relaxation and warming sensation spread on to the rest of my body. A seaweed mask was hand-wisked and applied to my already re-energised complexion, while Su-Man proceeded to give me a vigorous foot massage-the best I ever had. She massaged my calves and thighs, truly working her knuckles in the dormant muscles tissues. My feet were cleansed with warm towels and then Su-Man linked her fingers throughout my toes and rolled them back to front – after it, for the first time, I truly understood the meaning of the phrase like ‘walking weightlessly on clouds’ when I got off the treatment table. Astonishingly, that feeling lasted all day ! That is the magic of Su-Man’s shiatsu massage technique for you ( a while back it helped her to get over a very painful back injury – one of the negatives which goes alongside being a professional dancer ). Throughout the facial Su-Man dispenses her wisdom, if you ask her questions. My personal Su-Man wisdom quote that truly stuck from that day onwards was ‘your face is like a sheet, it needs to be ironed’. Beware, no place on your face will be left untouched, your scalp and nostrils included and it will leave you with the most wonderful ‘awake’ feeling’ and a sense of awareness of facial muscles. You know what was most unusual and touching during my treatment that day? When the foot massage was finished Su-Man took my socks and put them on my feet, before tucking them under a blanket. When I expressed my gentle surprise the reply that came back touched me and told me a lot about the type of person Su-Man is: ‘let me be your mother in this moment in time, as only a mother would nurture in moments like this’. Before I knew it, a lavender compress was applied to my face, my shoulders and my neck were stretched upwards, making me feel a few inches taller instantly. My face flushed and plump, my bone structure more prominent – and I so wished the treatment just went on and on but like all good things it just came to an end. I had a facial in June and now that the end of the year is almost upon us I can honestly tell you that it was one of the best combined body treatment and facial I ever had. You will certainly never forget, noticing the difference it makes to your complexion and muscle tone in the simple, yet very effective way. Just bare in mind that you don’t go to see Su-Man if you want superficial pampering, you go to see her to pamper the mind, while vigoriously exercising the muscles.